In May 2016, Saint-Gobain Performance Plastics agreed to fund the engineering design work by Pennichuck Corp. for the potential expansion of the existing public water system in Litchfield, in addition to funding the provision of bottled water to homes in the vicinity of the company’s Merrimack plant whose private wells contained elevated levels of PFOA. Pennichuck water line extension work in Litchfield. August 18, 2017 – 308 properties have been connected to date. Property owners that have not contacted Pennichuck about connecting to public water are being registered as refusing connection to public water. Once contractors have demobilized from the area, NHDES will no longer require Saint-Gobain to pay costs of connecting to public water, installation or operation of water systems or continued delivery of bottled water will be the responsibility of the property owner. 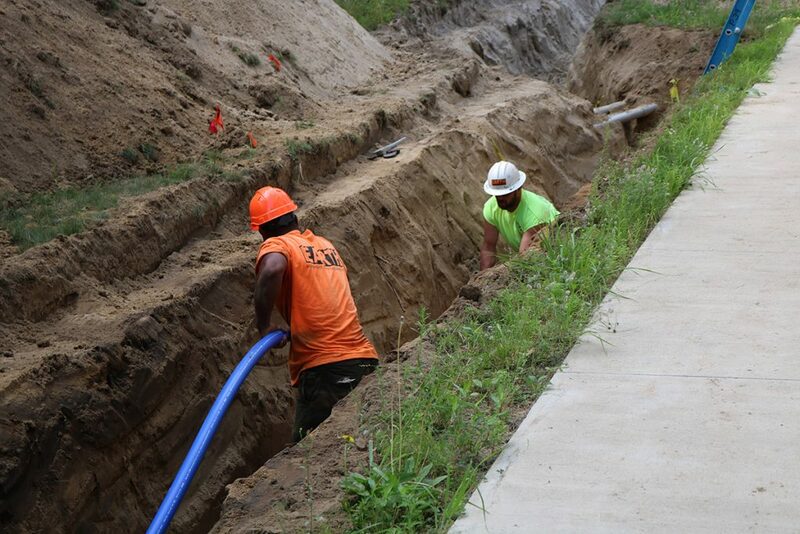 July 21, 2017 – All water mains and connection stubs for the Litchfield water system extension project has been installed at this time; 240 properties have been connected as of July 7. May 25, 2017 – All water main for the Litchfield water system extension project has been installed; 187 properties have been connected to date. Pennichuck Corp. is working on water line design for 37 additional properties in Litchfield. Saint-Gobain has agreed to reconnect all outside spigot(s) and/or irrigation systems, to the extent practical and feasible, to residents’ private wells. February 10, 2017 – 114 main-to-stop water services have been installed to date. Ninety-three (93) properties are fully connected. January 13, 2017 – Water services are being connected in the areas where water main installation is complete. Sixty-eight (68) properties are fully connected. Stop-to-end services are being completed in these areas. December 16, 2016 – Construction continues on several fronts. Pennichuck is proceeding with their investigation of the effort required to connect additional Litchfield properties to public water. Pennichuck has prepared a preliminary cost estimate for connection of these properties, with is being reviewed by Saint-Gobain. October 14, 2016 – Work to connect 360 Litchfield homes to the Pennichuck public water system set to begin. Unless unforeseen early winter weather interferes, 173 of the homes are expected to be connected by the end of this year. The work on the remaining Litchfield homes will be completed in 2017, and in the interim these homes will receive point-of-use (POU) filters until they are fully connected to the public water system. August 25, 2016 –NHDES and Saint-Gobain announced arrangements with Pennichuck Corp. to secure bids to extend the Litchfield Public Water System to allow for the connection of up to 360 Litchfield homes and businesses that are currently on private wells.